Campākali nāmere. Śrīkr̥shna Baruwā. Nagm̐āo: Nagm̐āo Shṭorarca, 1967. From the University of Chicago Library. চম্পাকলি নামেৰে Campakali Namere by শ্রীকৃষ্ণ বৰুৱা Srikrishna Baruwa. 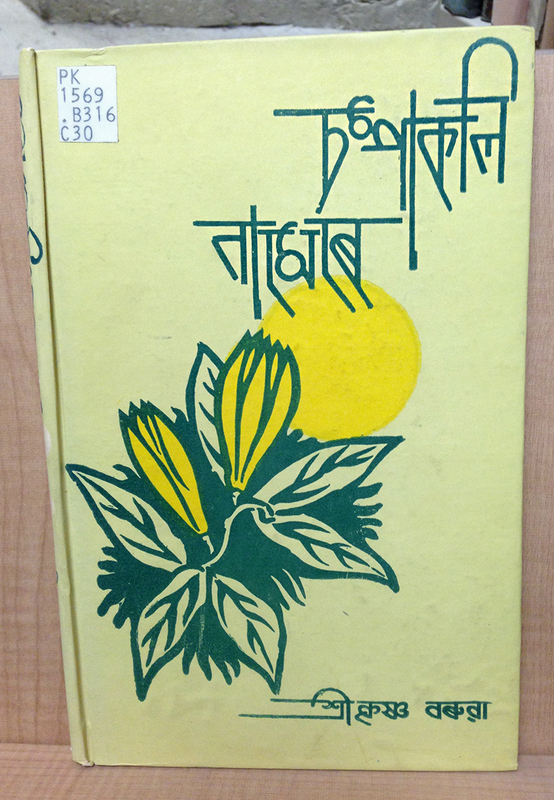 ** Update: The ever-helpful Liang Hai tells us: চম্পাকলি is a Sanskrit word, literally “a flower bud of champak (Magnolia champaca)” (hence the cover art). — here is an image of the flower. Thank you, friend! Very interesting intersecting lines create the letterforms on this cover (what am I seeing in this? Kandinsky? Frank Lloyd Wright?). How interesting are those circular “knots” on the Ma ম, and how deep the Na ন goes – I thought it was a Devanagari Ta त at first.